Another week has come an gone, which means it’s time again for Big Easy Magazine’s Progressive Weekend events! New Orleans is in for a wet weekend but never fear – there’s still plenty of fun to be had while staying dry. 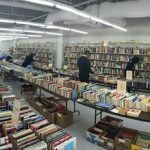 Used Book Sale – 10 a.m. to 2 p.m. The Friends of the UNO Earl K. Long Library are selling off thousands of used books, CDs, DVDs, and vinyl at bargain prices. Come out, buy some books, and support the UNO library! 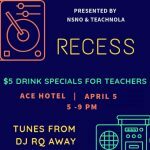 Recess presented by NSNO & TeachNOLA – 5 p.m. to 9 p.m.
Support New Orleans teachers while listening to tunes from DJ RQAway at the Ace Hotel New Orleans. All teachers receive $5 drink specials. 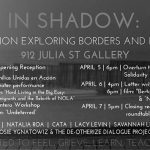 In Shadow: An Exhibition Exploring Borders and Migration – 6 p.m. to 9 p.m. This collaborative exhibition transforms 912 Julia St. Through constructed darkness, explore storyboards, hand-carved portraits, forms, and more that tell the story of criminalized migration. The lit half of the gallery will feature photos, fabric art, sculpture, and screen prints exploring the borders of the world. 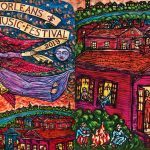 New Orleans Sacred Music Festival – 9 a.m. to 6 p.m.
Come out to the New Orleans Healing Center and hear sacred music from many traditions. This event features workshops, art exhibits, psychic readers, storytelling, a women’s circle and more. People of all faiths, races, and cultures are welcome to join this immersive experience of music, art, and food from around the world. 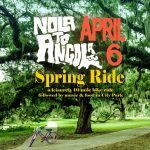 NOLA to Angola Spring Brake – 10 a.m. to 2 p.m. Rain won’t stop this ride! Nola to Angola’s 2nd annual spring ride for prison justice is a leisurely 10-mile loop visiting four organizations that focus on youth and incarceration throughout the city. The ride ends with music and a BBQ in City Park. Gimme A Brake (Light)! Free Brake Light Replacement Clinic – 11 a.m. to 4 p.m. 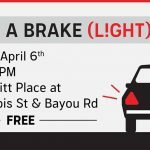 The New Orleans Democratic Socialists of America will be offering free brake light replacements for anyone who needs them at N. Dorgenois at Bayou Rd. on Saturday. The supplies are free, and they’ll even teach you how to replace the lights on your own! Norman Mayer Library Food Waste Collection – 2 p.m. – 3:30 p.m.
Bring food scraps (no meat, bones, or dairy) to the Norman Mayer Library entrance. Toss frozen fruit and vegetable scraps, egg shells, nut shells, tea bags, coffee grounds, plain pasta, or bread into the provided compost bins. 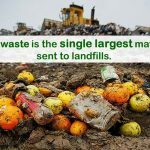 Your scraps will be turned into valuable compost instead of going into landfills. Serve Meals for Homeless NOLA Youth – 3:45 p.m. to 6 p.m.
Make a difference for 100 homeless New Orleans youth this weekend. Volunteers are needed to help serve dinner at Covenant House. 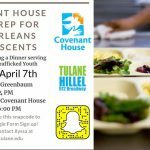 Transportation will be provided to and from Tulane Hillel to Covenant House. 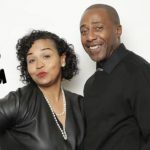 Live: A Conversation with Fox and Rob – 6 p.m. to 7 p.m. This week, Fox and Rob will be having their live conversation on social justice from the Sky Lobby at 930 Poydras St. Drinks are served at 6 p.m. and the conversation starts at 7 p.m. You can also follow the conversation from home on their YouTube channel. No matter how you choose to spend your weekend, remember – every weekend can be a progressive weekend! We hope that these community support suggestions will help you enjoy yours.